Twelfth Night is Shanty Productions’ debut film, as well as the feature debut of director/adaptor Adam Smethurst. It’s quite a launch for an independent film company, with a truly excellent cast, fine use of the West Sussex countryside, and an effective publicity machine. And while the film betrays some awkwardness in its execution and some caution in its interpretive choices, it’s a promising opening salvo for a new company dedicated to high-quality, multicultural adaptations of classic plays. The arresting publicity image, featuring so-hot-right-now Sheila Atim washed up on a pebbled beach, offers to open up a fascinatingly underexplored political context for the play. Here, Viola is only one of a number of refugees, among whom the captain and his mate rush, tending to children and helping Viola off the beach. Viola’s transition to the enclosed world of the suburbia of the home counties allows for a subtext of assimilation throughout, a hunched Viola-as-Cesario shuffling awkwardly into immaculate living rooms and trying to negotiate the codes of the upper-middle class. The nature of the independent film becomes a political advantage here, with the stately homes and grand estates so typical of productions of Twelfth Night giving way to a more mundane kind of luxury, in houses that look dully familiar and yet which are far beyond the financial reach of most of the populace. The film is claustrophobic at times in its rootedness in real living rooms and kitchens, and in this it is reminiscent of nothing so much as Joss Whedon’s Much Ado about Nothing, except here without the same level of self-indulgence. The cloistering of the contemporary good life contrasts markedly with the shots of a hoodied Antonio (Zackary Momoh) and Sebastian (Atim again, now wearing a beanie) huddle for warmth in a red van while waiting at a level crossing. More so than ever for a Twelfth Night, it seems initially impossible that Viola and Sebastian’s spheres might ever overlap. The privileged world of this Twelfth Night pokes subtle fun at Orsino in particular, who in Ben Whybrow’s performance is an overgrown and somewhat petulant student, his room full of musical instruments and self-consciously trendy furniture, and with a balcony overlooking a swimming pool. He turns up at one point in sports clothes to wake up his ‘attendants’ who are crashed out on the sofas surrounded by beer bottles, and the self-absorption of the would-be lover is only emphasised by the relative childishness of his surroundings. Meanwhile, Olivia (Shalini Peiris) is also played very young and similarly oblivious to the extent of her privilege; much of the film’s best comedy comes from her attempts to remain composed while lusting after Cesario. And Atim’s bewildered, almost taciturn reaction to the people whose houses she enters offers the perfect counter to their insulated behaviours. The performances are decent throughout, a product of weeks of ensemble rehearsal before filming began. While the setting imposes a certain restraint (of which more below), there’s a lot of fun, especially when performers like Dominic Coleman (a nicely camp Sir Andrew, balancing dignity with an inability to retain that dignity for more than few seconds) and David Nellist (a fine-voiced Feste who gently mocks those around him) get the opportunity to play; Coleman in particular has a fine line in bluster, constantly looking to Sir Toby for support. The playfulness that occasionally shines through is at its best in minor characters; Alexander Delamere, for instance, is a delight as the Priest, carrying and enjoying a plateful of food all through the chaos of the final scene, and thinking better about intervening during a moment’s pause. The highlight is inevitably Atim, pulling rare double duty as both Viola and Sebastian. I wish the film had been bold enough to allow for some direct-to-camera address, as the two characters remain somewhat aloof throughout, but in both roles Atim does fine facial work, her eyes betraying the concern and exasperation that the rest of her is too diplomatic to show. Viola is more restrained than Sebastian, who brings a lairier attitude to the fight with Sir Andrew. Atim’s Cesario, too, is pleasingly awkward, the tall Atim hunching down and attempting to seem unintimidating, but gradually allowing more of Viola’s emotion to come through. The most significant problem that plagues the film is its length. At two hours and forty-five minutes it’s painfully slow, its dutiful textual fidelity a throwback to the old BBC Shakespeare. Smethurst’s reluctance to cut is understandable, especially as it will inevitably enhance the film’s use to teachers, but it’s a disastrous choice in respect to the momentum and vitality of the film. The length is exaggerated by the inevitable constraints of real locations that tempt the actors into a subdued naturalism (without even the melodrama of soap), and by an over-literal approach to continuity editing which ensures that we don’t miss a second of (for example) Viola getting out of a car to meet Malvolio. Shot-to-shot it’s very competent, but the slowness of both photography and performances means that the whole becomes monotonous. The moments where the film openly tries to break the monotony show the creative potential. The drinking scene, for instance, begins with a lovely shot of Sir Toby’s face (Simon Nagra) through wine glasses; whlie the scene then becomes rather more pedestrian as the men drink and sing in a circle, these occasional gestures towards more adventurous composition are a nice gesture towards a more confident filmic language. A more effective set of choices is to have Malvolio (the always tremendous Antony Bunsee) regularly appearing suddenly in the frame with very little preamble; his interruption of the drinking scene sees him suddenly there in the room, and when Olivia calls he arrives in the shot as the camera cuts, perfectly capturing the sense of the almost omniscient steward. Bunsee is also the star of one of the standout sequences – the letter scene. Again, the scene is scuppered somewhat by the adherence to the restrictions of the real location; the eavesdroppers are so far away from Malvolio as to be blurry in the background, or else the camera has to cut to them for a quick shot of them listening, with none of the fun of a theatrical overhearing scene given time. But Bunsee milks his long speeches for every over-articulated anunciation, finally breaking into a more theatrical mode with his expressive gestures of possession of his countdom; and then, sitting on a bench, blinks tears away as he quietly celebrates the happiness he has found in love. Later, in a beautiful bit of editing, the camera cuts away from Malvolio as he tells Olivia that some have greatness ‘thrust upon ‘em’, instead showing Olivia and Maria’s appalled reaction to the steward’s thrust. The choice to cast Atim in both roles showcases the actor’s talents admirably, allowing for fine distinctions between Sebastian and Viola/Cesario. Inevitably, the decision ruins the final scene, when the budget can’t stretch to superimposing the two performances into the same shot. Not only does it deny the wonder of seeing the two simultaneously, but it also scuppers the reactions of everyone else, with the close-ups making it unclear who is looking at whom. Peiris keeps up much of the energy of the climax as an increasingly outraged, then overwhelmed, Olivia, but the practical need to keep Viola and Sebastian as separate as possible can’t help but work against a tone of reconciliation. 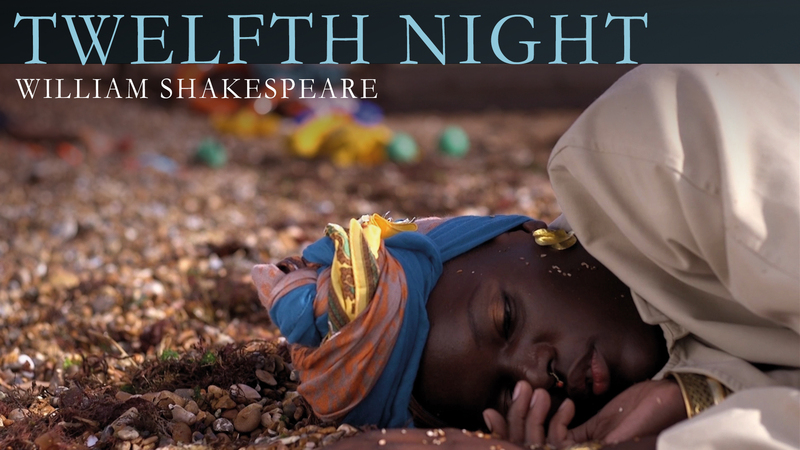 Twelfth Night is a bold attempt by a new production company to produce a faithful Twelfth Night for a new generation, and on those terms it succeeds. One hopes that, assuming the company continue to produce films, they’ll lean more heavily into the affordances and conventions of film, taking more risks with storytelling and interpretation (the refugee angle of Viola’s first scene never returns, sadly). The reluctance to let go of notions of textual fidelity and make choices stymies both the comedy or any bolder interpretive angle. But the company have some skill with actors, teasing a wonderful performance out of Bunsee in particular that climaxes in a dignified, emotional exit that is the film’s best work. Many thanks to Shanty Productions for providing a preview copy of the film.